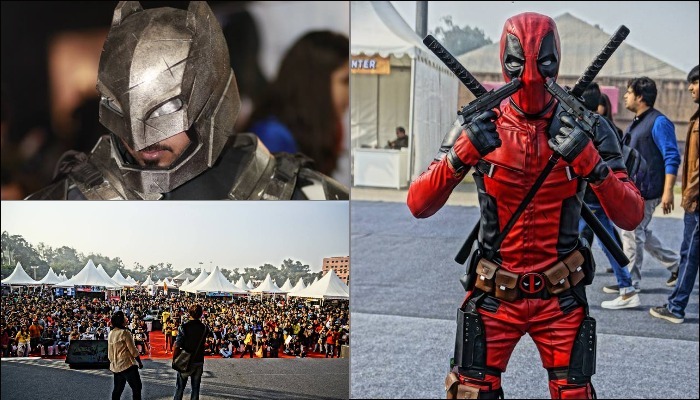 Delhi Comic Con is back and we are losing our minds! 8th edition of Delhi Comic Con to begin TODAY; GOT’s Night King to attend the event! Listen up Delhiites! The comic con is back in town and you shouldn’t miss it for the world. Comic con is a great place to get your nerd out, bear witness to some crazy cosplays and lose your mind over the incredible merchandise. Delhi Comic Con will be organized from 7th to 9th December at NSIC Grounds, Okhla from 11AM to 8PM. Comic Con is a fantasy lover’s dream come true. The name, Comic Con or Comic Convention suggests that the convention would be a celebration of just comic books and the universes related to them, but in reality comic con is way more diverse. The comic con celebrates books, movies, video games and everything else. It is a celebration of the imagination, the mind, the life behind every story we’ve read, heard or seen. From Harry Potter to Star Wars, from Breaking Bad to Deadpool, the comic con has something from everyone’s favourite fandoms! After the success of their inaugural event in Delhi, it spread out to other cities such as Bangalore, Mumbai and Hyderabad, where it has gained a lot of appreciation and adulation from dedicated fans. Each year, fans eagerly await the festival and spend countless hours making their cosplay costumes as real as the original ones in the film, show or comic. This year, to spice things up, the Comic Con Delhi has organized a cosplay competition and the prize for winning this competition is ₹50,000. Like every other year, this year too many special guests there will grace the event and give insights into the making of your favourite films and comics, the art style and thought behind each storyline. Among the many guests are John Layman (creator of Marvel Zombie comic series), Declan Shalvey (creator of Deadpool) and the Night King from Game of Thrones himself- Vladimir Furdik. These guests will be at the event on all days will tell the visitors about the things that inspired them to have such groundbreaking ideas and create such innovative stories. Tickets for the Delhi Comic con are available on Paytm and insider.in. Fans can also buy Super Fan Passes, which will give them the opportunity to have one on one interaction with their favourite guests. So be sure to get your geek on this year at the Delhi Comic Con!